Secrid Slimwallet Vintage -lompakon nahan pinta on hieman hangattu ja viimeistelty vahalla, mikä antaa sille rosoisuutta ja särmää. Siihen kertyy ajan mittaan persoonallisuutta ja merkkejä elätystä elämästä. A well made high quality product. Fits nicely inside the pocket. Wallet is awesome, excellent quality. 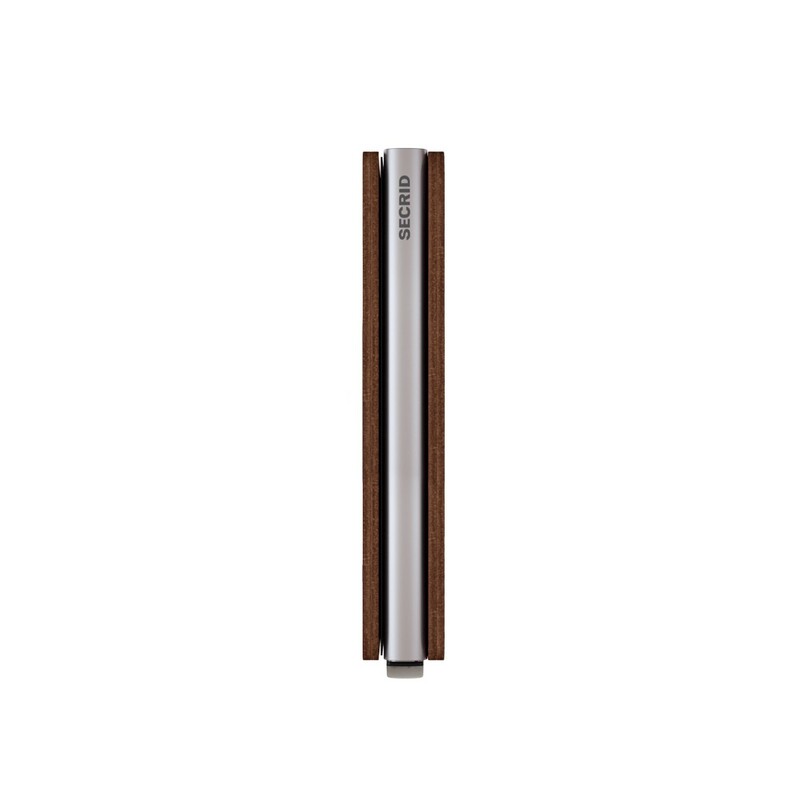 Small, slim, functional and great looking minimalist style wallet. Packaging was good and delivery on time, hassle free and convenient. Fast delivery, well packaged. Secrid wallet really works as it's advertised. A slim wallet that's not only functional but it also looks good. For months I've been looking for the perfect wallet. One that will be ultra slim and small, but also practical. One that will be conformable to walk around, but also good looking. Finally I found it! Love the secrid mechanism and the soft feel of the good quality leather. I wish the wallet could have been slimmer though, especially the part where the leather is attached to the aluminum case. Ship to Thailand less than 7 days. Really love the product, nice color nice product. This is a great wallet - practical and stylish. I bought it as a gift for my sartorially discerning husband, and he loved it! nice design and good quality. I am satisfied with the order. Good stuff as advertised in the web. The wallet is excellent. 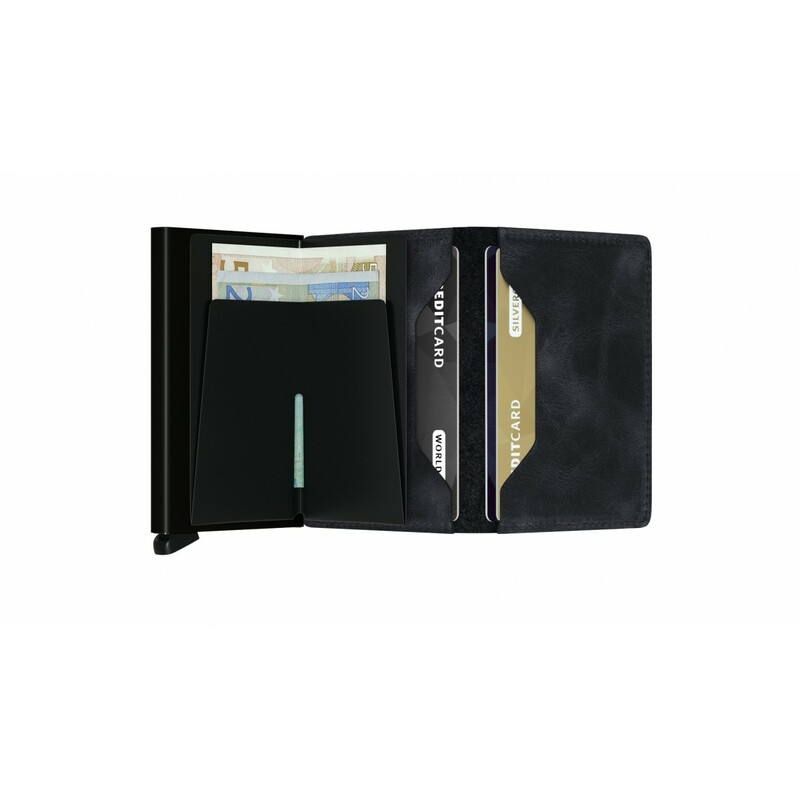 It is a bit thicker than your usual slim wallet, but it fits a lot more cards. The materials and craftmanship are top notch, the card mechanism seems sturdy. Would recommend to everyone who loves minimal wallets but needs to carry around more than a few cards. It fits 4 cards comfortably in the leather part and about 6 cards (depending on thicknes and if they're embossed) in the aluminum part. I am also really satisfied with the buying process, since they shipped the order on the same day, and it arrived at my door the next day which was really a surprise. Received this wallet within a week and have loved it ever since. 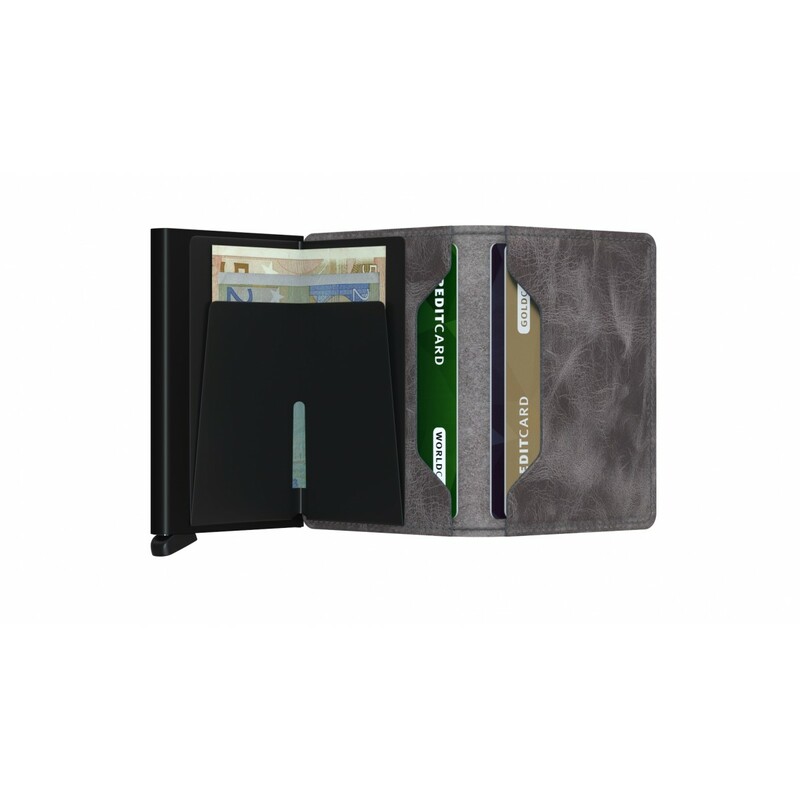 Great for front pocket and is easy to retrieve a card when needed. I give it five stars. Lovely designed, cool, compact, easy to use wallet. Nice quality leather, fits in both back and front pocket and can hold all the cards I need. The right choice! I like it a lot! Very good size. Good quality leather. Holds 6 cards which is enough for me for daily use. The aluminum could be improved if there it is anti-scratch. 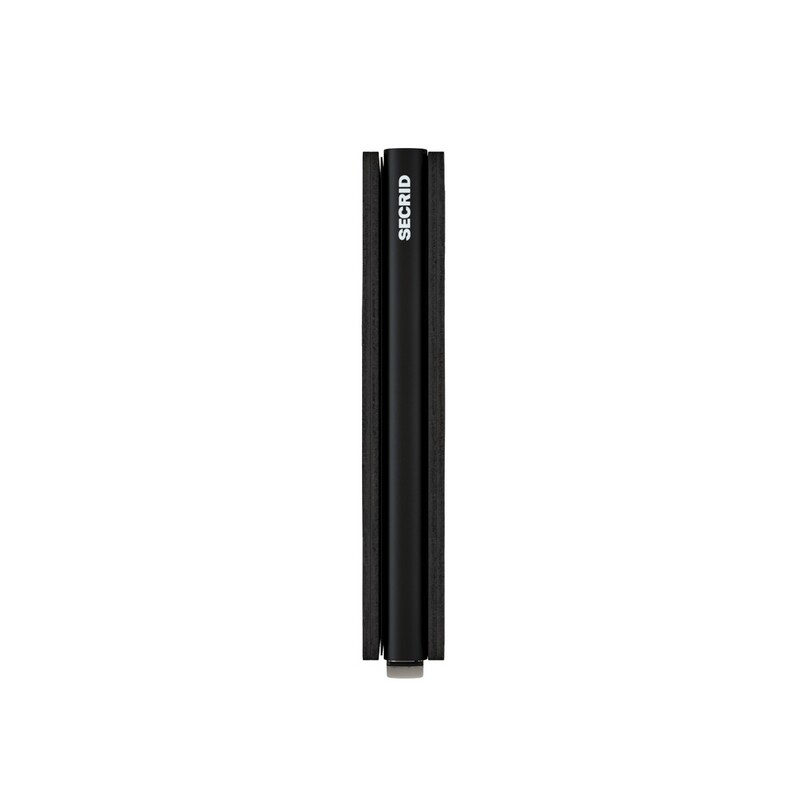 Overall a very good product with reasonable price! Highly recommend! This wallet is great. My husband is very excited and loves it. It is practical and easy to use. The quality of this product is very good. Love it! The wallet arrived in time, in a beautiful packaged. It actually looks better than the images in the website. Nice small wallet. Good quality. My father loves it. Best wallet I had so far, the materials are good and look durable. Really enjoy it so far! I ordered this wallet in vintage brown and it looks great. I ordered it on a Saturday and it arrived on Wednesday! I will say that the wallet is smaller than a typical wallet, but fits in pockets easily and holds cards and cash easily. The wallet was nice and it’s good to use for the card.I give it someone as a gift and that person was so happy. Purchased a wallet for myself in Malaga Spain, liked it so much went on line to purchase 2 more as gifts. Best wallet I have ever used. So convenient to access credit cards. Small enough to keep in front pocket. Wallet is of high quality. Absolutely loving it. This is a really nice wallet, the feel of the leather is very good, and the way it exposes the cards is great. It's very small, I was impressed over how small it is compared to my old wallet. If you have more than the 5-6 cards the slot accepts, do know that each extra card slot inside is tight, so you will notice the bump for each card. I'm glad about the product. It's a good looking wallet and the mechanism is well designed. The wallet was everything I expected and more. I currently hold 5 cards (3 embossed) in the chamber + 4 in the inner leather pockets, in addition to the occasional hotel room key that I keep in the inner fold for easy access. The cash folder is sufficient for my needs, but I rarely carry more than 6 bills, which is about the limit if you want the wallet to close fully. Fun fact, if you have a heavy (metal) credit card and press the ejection lever quick enough, the card pops out entirely, that's a fun bar trick. Definately the best wallet I ever had. Only cons is that leather (I chose vintage chocolate) is quite soft and after few days of using this product you can see some scratches. Amazing product!! just what they said, just what i wanted! I really like the wallet. Design is simple but very functional. I appreciate the click button in the metal placer which made the cards out easily, this is the main reason I choose to purchase this wallet. However I think the leather is prompt to scratches, I already have few visible scratches although I have been taking good care in using it. There are a lot of the leather "residue" falling from the middle layer as well. I bought the wallet for my boyfriend and he absolutely loved it. He was so happy. I also had trouble buying the wallet online and yall really helped me. So thank you. great product, fast delivery, like the color, been using it for about a month, so far so good. Great product. Every time I pull it out, I feel so confident to have the coolest wallet around. Girls love it when we go on dates. It makes me look organized, clean, and cool. Thanks guys. It's awesome. A bit expensive, but it is definitely worth it. I received my wallet today and I am really impressed with the wallet's size, looks and ease of usage. 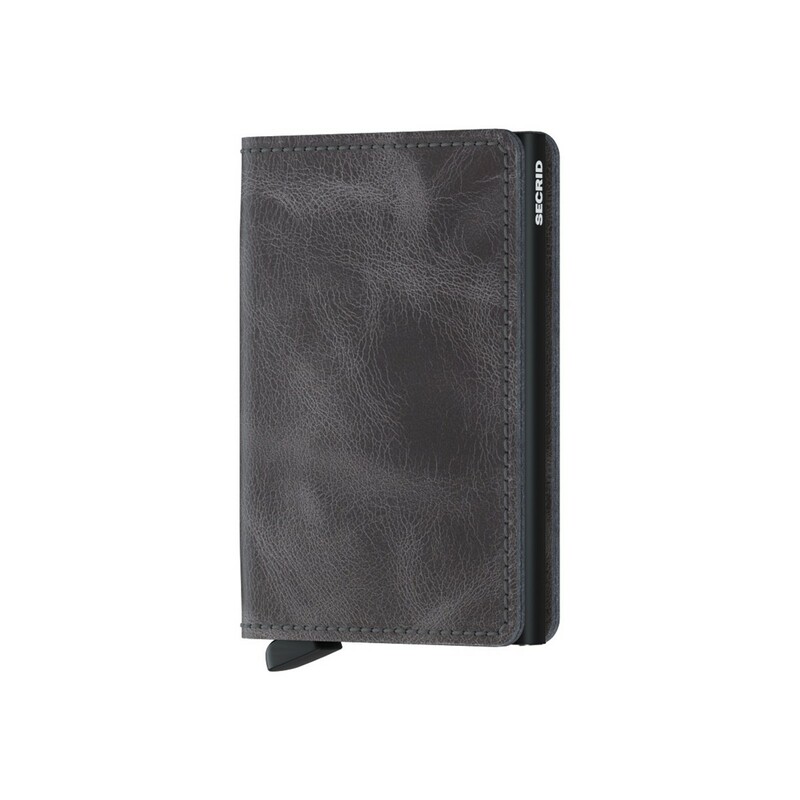 The card case works smoothly and the leather quality is very good. I am really enjoying using the wallet till now. Easy, fast and excellent quality. The greatest wallet ever! Best wallet I have ever had. Completely satisfies with the quality of the product. Hats off to mukama team for the steady service. I had ordered a SECRID slimwallet from Mukama, their shipping is perfect, the product is perfect, and I have received this at such a nice cost that I'm thoroughly satisfied with their service. Will definitely order from here should I have a need for another product that is sold here. Very happy with the service!!! Great service, fast shipping and product of great quality. Love the style and efficience. Simply an amazing wallet!! compact and simple usage. Great great great!! Bought this for my boyfriend; best wallet he had. It's small, practical and high quality product. Worth the cost. I was looking for a slim wallet that could easily fit into my front pocket of my shirt as I carry my phones in the other pockets. This was pretty slim and perfectly fitting my needs. I didnt want a minimalist non leather wallet which looks cheap. This is the perfect product who wants a small wallet with a good genuine leather. It has a premium class. All my cards and cash fit inside well. The only two cons are. 1. Its difficult to keep coins and 2. The vintage black leather gets scratched kinda easily. So we have to be more careful. I received my wallet this week and I am really impressed with the wallet's size, looks and ease of usage. 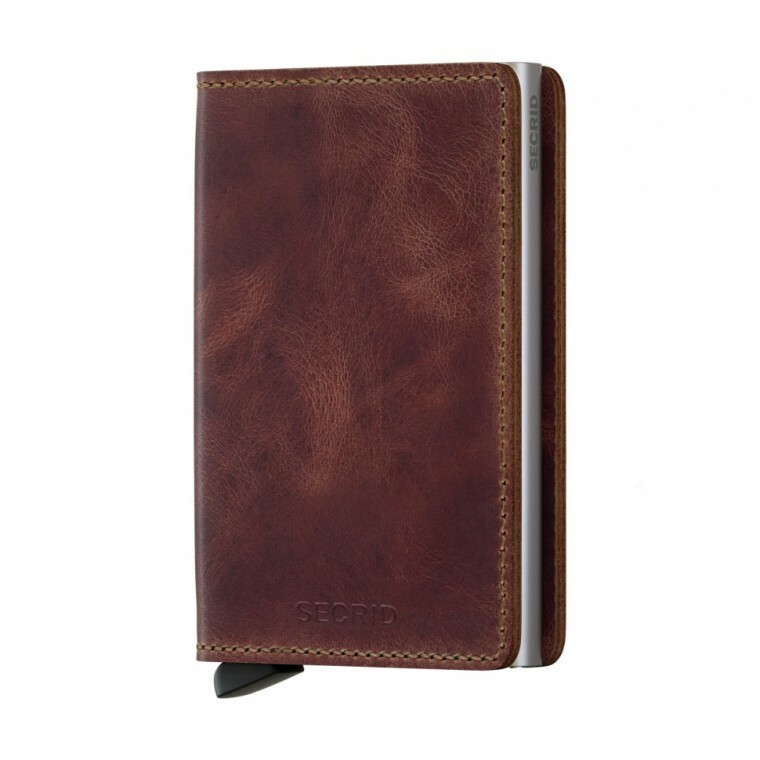 The card case works smoothly and the leather quality is very good. I am really enjoying using the wallet till now. I ordered the vintage black model of Slimwallet, and I am extremely happy with it. I saw some models in local shops in my city, but what they had in store wasn't to my taste. I'm glad I ordered from here and found my exact taste. Secrid slimwallets are very sturdy and extremely useful. Just love it. looking very good ;) thank youuuu! Forse cercavi: ottimo prodotto. velocissimi nella spedizione. sono molto soddisfatto. il service soddisfa ogni minima richiesta tempestivamente. credo diventera' il mio sito di riferimento visto il rapporto qualità prezzo. great product. fast shipping. I am very PLEASED. the service meets all minimum required promptly. I believe will become 'my site reference seen the value for money. Great product and service form Mukama!! Extremely helpful staff. Great product. Good price. Postal delivery took a bit longer than expected. very nice product and excellent service from the site Very good quality of the letter, came real fast with no problems. great product and great support from MUKAMA staff, unfortunately shipment took too long. MUKAMA staff is helpful and gave all support needed with an amazing response time every time in under 15 minutes. It's fantastic, I'm really satisfied! Käytännöllinen ja tyylikäs. Hyvä valinta ohutta korttilompakkoa hakevalle. Tarpeeksi tukeva että kortit ja käyntikortit pysyvät hyvänä. Vipuominaisuus hyödyllinen yleisimmin käytössä oleville korteille. Oma paikka myös seteleille, mikä plussaa. I am happy with the product and its appearance. It takes up less space in my pocket than an ordinary wallet. The leather parts hold the other cards fairly snugly -- it could be a little looser or perhaps smoother, but it is gradually stretching. The double version would be very thick and I wonder if the next step for the makers would be a side-to-side double that would fit comfortably and "flatly" into a pocket or a bag. Tilaamani vintage mustaa nahkaa ollut lompakko saapui nopeasti perille ja oli hyvin pakattu. Vajaan kuukauden käytön aikana olen ollut tuotteeseen tyytyväinen, lompakkoon mahtuu seteleitä paksultikin ja kortit on tarvittaessa vaivaton nostaa esille. Ainoana pienenä miinuksena on, että nahka on hieman vaurioitunut avaimien ollessa samassa taskussa lompakon kanssa, mutta siitä voin syyttää vain itseäni. Tuote laadukkaan oloinen ja lahjan saaja on tyytyväinen. Ainoa mitä jäin miettimään, olisiko pitänyt tuo nepparillinen ostaa. Käytännöllinen, viuhka korteille toimii hienosti ja nahka vanhenee arvokkaasti. Pari etäluettavaa korttipaikkaa, joka hyvä kanta-asiakas-, kulku- tai bussikorttia varten. Toimiva tuote,olen tyytyväinen jokseenkin hintava mutta ajaa tarkoitusta! Erittäinkin loistava tuote suoraan taskuun postilaatikosta. Paras lompakko ikinä mitä olen kokeillut, kaikki tarvittavat kortit mahtuvat mukaan, mahtuu hyvin farkkujen etutaskuun ja kokonsa puolesta marginaalisesti suurempi kuin pankkikortti. Kuukauden käytön jälkeen tullut siihen lopputulokseen että en ikinä vaihda lompakkoa muuhun. Todella hyvä ja näppärä lompakko. Suosittelen. On pieni hyvin toimiva lompakko. Tilasin lompakon puolisolle lahjaksi ja oli todella mieleinen hänelle! Näppärän kokoinen ja hyvälaatuinen. Ensivaikutelma on oikein mainio. Lompakko on kompakti, ja korttikotelo toimii niin kuin pitääkin. Mukaan mahtuu juuri tarvittava määrä kortteja ja sisätaskuihin muita lipukkeita tms. Ulkonäkö on tyylikäs, mutta nahkapinta vaikuttaa naarmuuntuvan helposti. Kokonaisuutena oikein hyvä tuote kompaktia lompakkoa kaipaavalle. Aivan uskomattoman hyvä ja toimiva. Kaikki kortit mukana ja helposti käytettävissä aina. Hieno ja hyvin toimiva lompakko, Vaatii sisään seteleitä muuten kansi jää löysäksi. Nahka herkkä naarmuille. Hyvä ostos! Lompakko vastasi tyylikkyydellään omia odotuksiani. Myös materiaalien laatu on hyvä. Lompakko tuntuu kädessä ja käytössä hyvältä, sekä pienikoko tuntuu etutaskussa. Antaisin muuten varmasti 5 tähteä, mutta yksi asia minua huolettaa: Korttikotelon ja nahkaosan/setelipidikkeen välinen kiinnitys. Muutaman setelin/kuitin jälkeen rupesi vaikuttamaan, että liimapinta lähtee irti. Tästä syystä en ole enää pitänyt kuitteja/setelejä niille tarkoitetussa paikassa vaan muissa lokeroissa. Näitä muita lokeroita on onneksi 2 kpl. Parin viikon käytön jälkeen tyytyväinen tuotteeseen. Juuri sopivan kokoinen ja toimiva. Miinusta vintage nahan helposta naarmuuntumisesta. Upea kokonaisuus mihin mahtuu kaikki terpeellinen pieneen kompaktiin tilaan. Toimiva lompakko ja kaikin puolin kätevä. Ainoa miinus tähän asti on ollut se, että nahka on todella herkkä kulumaan: lompakkoa pidän taskussa kännykän kanssa ja nyt parin viikon jälkeen nahka on kulunut huonompaan kuntoon kuin edellinen nahkalompakko samanlaisessa käytössä reilussa kolmessa vuodessa. Tähän hintaan odottaisia nahkan kestävän siistinä peruskäyttöä. Lompakko on todella kätevän kokoinen ja mahtuu taskuun kuin taskuun. Cardprotector tuo turvaa luvattomalta skannaukselta - koskaan ei tiedä milloin digiajan varas iskee esim. julkisessa liikennevälineessä! Kortit liukuvat sujuvasti ulos ja on huomattavasti nopeampi tapa saada maksukortti käteen perinteisen lompakon kaivelemisen sijaan. Materiaalit ovat hyvänlaatuisia ja ruskea nahka saa ajan myötä kivan tekstuurin. Paras lompakko mitä miulla on ollut. Tilaus ja toimitus huippunopsaa. Sunnuntaina tilaus sisään, tiistaina lompsa kädessä. Nahkainen Secridin Slimwallet on aivan törkeen hyvä. Laadukas ja kompakti! Upee lompakko ja pirun näppärä jos tarve sama ku itellä että lompakossa ei oo muuta ku kortteja. Jos kantaa paljon käteistä ni sitte ei ehkä oo oikee vaihtoehto. Tuntu laadukkaalta ja kaikki tarvittavat kortit mahtuu hyvin mukaan. Tuntuu ainakin takin sisällä niin pieneltä, että välillä pitää ihan tarkastaa onko lompakko mukana. Tuote erittäin laadukkaan tuntuinen ja kaikinpuolin hyvä. Todella kompakti koko. Aivan loistava tuote! 6 korttia kotelossa ja pari nahkataskussa. Setelitkin kulkee hyvin. I am very happy with my new wallet. It’s barely half size and every card, paper and note in my old boring wallet fits right in.